I just returned from visiting Potou Elementary School on the edge of the Sahara Desert in rural Senegal. In this remote location it was thrilling to observe teachers collaborating and coaching each other to use The CyberSmart Digital Learning Platform – a breakthrough approach for digital whole-class learning in schools without electricity. Given that formal teacher training had ended the year before, it would have been easy for teachers to slide back to their traditional lecture strategy while the digital learning platform sat unused. What I observed was a clear signal that the teachers were getting real value in adopting whole-class digital learning. “It makes my job easier,” I was told. Simplicity. Simple equipment is the key enabler of CyberSmart ‘s strategy to make educational technology as easy to use as a mobile phone. We are using the Android operating system, the dominant operating system found in mobile phones. This translates into tremendous preexisting familiarity among teachers. Plus, simplifying technology simplifies instruction for the teachers. Easy access to multimedia content like virtual science experiments and graphical images supports learning in ways the developed world takes for granted. For example, it takes just a few seconds for a teacher to use a graphical image of a chicken (above) that they otherwise would have had to hand-draw on a chalkboard. I observed the difference in student engagement, which is tremendous. 2. Efficient Use of Solar Power. 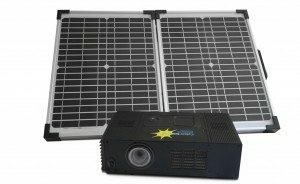 Solar power is a critical component of sustainable digital instruction for the simple reason that the vast majority of schools in the developing world have unreliable access to electricity or are not connected to the power grid. The CyberSmart Digital Learning Platform is specially designed to use minimal power and employs a unique solar-charging system with a removable battery. The battery is quickly charged and contains enough power to teach up to four lessons. 3. Effective Economics of Scale. Using a pedagogically sound whole-class learning model ensures maximum impact on the largest quantity of students, while also achieving the lowest cost per student. The cost per student is low because infrastructure requirements are totally eliminated, and we have radically minimized the amount of equipment being used. In fact, the cost to deliver high quality digital learning using The CyberSmart Digital Learning Platform can be as low as $0.36 per child/month – less than any other digital learning solution. Our economic model also considers the total cost of ownership, including maintenance and teacher training. The UN Sustainable Development Goals affirm the importance of harnessing digital learning to meet the dire need for education in developing nations. 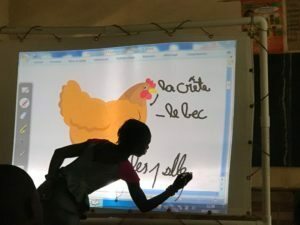 But during our 10 years here in Senegal we have observed many educational technology programs fail simply because it is not possible to adapt existing commercially available technologies to meet the needs of the developing world. We have seen many schools where the equipment just sits unused, which is why we developed The CyberSmart Digital Learning Platform. Working in partnership with the Senegalese Ministry of Education and The Earth Institute at Columbia University; CyberSmart Africa is a social enterprise that is harnessing mobile technology in a bold, new way that has enormous potential for quick uptake and massive impact.